This week we look at another subspecies, that of the Kecha Wacha! This one is more erratic than its predecessor. 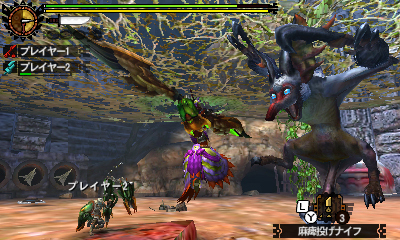 The Ash Kecha Wacha is a new one to Monster Hunter 4 Ultimate. It’s a fanged beast that’s able to glide through the air like some kind of flying fox; when its arms are extended, the brightly coloured markings make it look as it a giant pair of eyes are watching you. 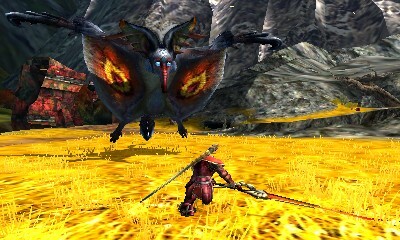 It can only be encountered at G rank, and is one of the first monsters you’ll fight there. 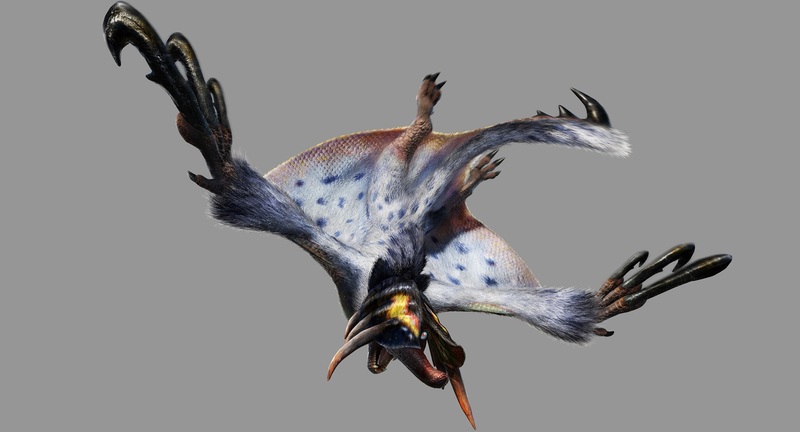 The Ash Kecha Wacha is light blue in colour, with fiercely long claws and large indigo-coloured ears which cover its face for most of the fight. These ears, both of its claws and the tuft of its tail can all be broken. It’s an annoying monster to fight in tiered areas. When you’re on the lower tier it will hang off the vines above it, firing its projectiles and antangonising you from a position that’s difficult to reach; it even sleeps while hanging when it’s low on health. When you’re fighting it from above, it tends to drop down and swing around below your feet before coming up through the ground to hit you. When it’s doing this, the only place you can attack it is its constantly moving claw. It doesn’t swing around as much when you’re above it as it does when you’re below it, so I’d recommend fighting it on the upper tier if you’re in one of these areas. The Ash Kecha Wacha will use its long claws to make a quick, sudden strike at any hunter that draws near. It can also draw them back behind its head and slam them into the ground for a large amount of damage; doing so will leave it stuck for a few seconds, giving you a good opportunity to attack. It can also spin on the spot, slamming its claws on to the ground as it turns in a semicircle that makes it difficult to approach. If you find yourself on the other side of it while it’s doing this, you can get a few hits in here. 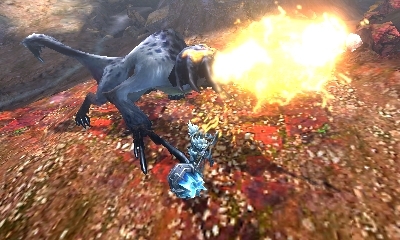 The Ash Kecha Wacha has a few options for hunters trying to pick it off from afar. Where the regular Kecha Wacha used water, this one utilises fire, shooting balls of flame across the area. It can glide around the map to quickly move from one side to the other to reach the hunter with ease. It can come out of this glide straight into either a fireball or a sweeping claw attack that almost looks like it’s trying to give you a hug. That’s it for the Ash Kecha Wacha. Next week is the Berserk Tetsucabra!